Following the launch of our integration with Sitecore we’re keeping up the pace with three new Asset Bank integrations with hugely popular content management systems WordPress and Drupal, as well as SharePoint, Microsoft’s collaboration and documentation management system. Here’s a brief overview of the benefits users of each system can expect. 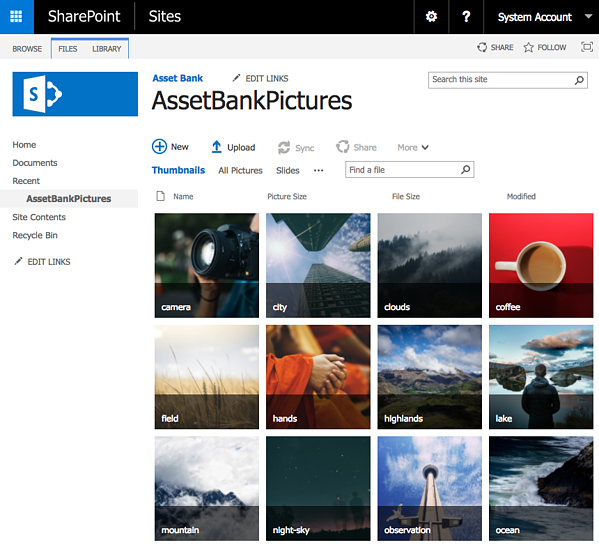 With our SharePoint integration you can automatically publish any of your digital assets in Asset Bank into any SharePoint document or picture library. There is also the potential to manually select and publish individual assets directly into SharePoint. These two CMS integrations for WordPress and Drupal work the same way. Once the integration has been set-up an Asset Bank button will be added to your CMS toolbar. Users just have to click on the button and then they can browse and select assets to use in a similar mode to their normal CMS workflow. To keep things easy all these integrations are available for a standard set-up cost of £2,500 ($3,250) and a minimal addition to your monthly support fee. Please get in touch to find out more.